Thyroid cancer is a malignant neoplasm originating from follicular or parafollicular thyroid cells and is the most common endocrine malignancy which accounts for approximately 2 % of all cancers diagnosed worldwide. The female/male ratio is 2–3:1. The median age at diagnosis is 45–49 years in women and 65–69 years in men. There are four major types of thyroid carcinoma: papillary, follicular, medullary, and anaplastic carcinomas. The first two of them are classified together as differentiated thyroid carcinoma (DTC). External radiation exposure in the childhood or adolescent period is the only well-known etiologic factor for DTC. Family history is important, especially for medullary thyroid carcinoma. Histologic type, age at diagnosis, tumor size, extrathyroidal invasion, and distant metastases are the main prognostic factors of DTC. Surgery, 131I radioiodine (RAI) therapy, and TSH suppression therapy are the main therapeutic options for DTC. Serum thyroglobulin measurement is a good marker after total thyroidectomy and RAI ablation therapy to detect the residual/metastatic disease. Except for local-regional recurrences, lung, bone, and soft tissue metastases can be seen in decreasing order. Surgery and 131I RAI therapy are effective therapies in metastatic disease. In 131I RAI-refractory cases, chemotherapy and targeted therapies have been used in the treatment. Redifferentiation therapy is another therapeutic option in that situation. Anaplastic carcinoma is the most aggressive form of thyroid carcinoma, accounting for 1–3 % of all thyroid cancer. Median survival is less than 5 months after the time of diagnosis. Surgery, chemoradiotherapy, and chemotherapy have been used in the treatment of the disease. Clinical trials are ongoing with targeted drugs and biologic response modifiers. In this chapter, we will discuss the DTC and anaplastic thyroid carcinoma. 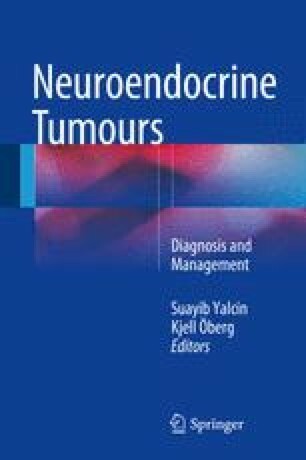 Medullary thyroid carcinoma has been discussed in another chapter.